The festivities are in full swing this time of year, and while we’re enjoying the merriment all around, we can also have tendency to overeat and get stressed. This also true for our beloved furry friends! It’s important to take our pups into consideration over the holidays. 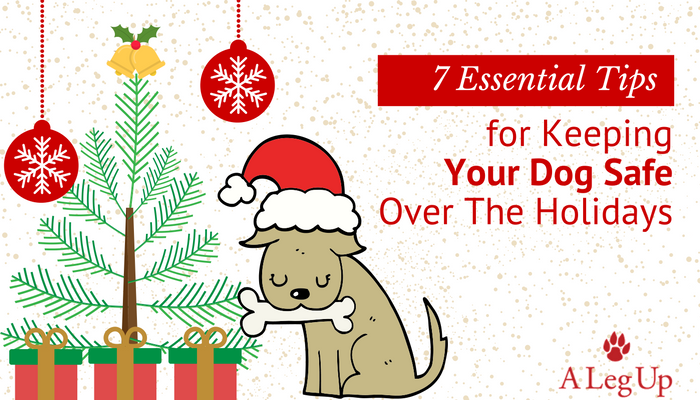 We know you’ve got a little something special under the tree for Fido, but what about keeping him safe during these hectic holiday times? It’s important to take our pups into consideration over the holidays. We know you’ve got a little something special under the tree for Fido, but what about keeping him safe during these hectic holiday times? Chances are they’ll love the extra attention, snuggles, toys and adventures but we’ve put together our top safety tips to keep in mind moving into the holidays. A good long walk or game of catch can do wonders to tire our pups and help then settle during the busy times of the day, or later when the guests arrive. If you are planning on hosting guests, or have friends and family that are happy to have your pup tag along, a little meet-n-greet goes a long way. Take a minute to let your pooch get acquainted, this will help everyone to be at ease in their new company. We don’t doubt that you include your pup on your shopping list, we do too! But, keep in mind it’s best to source toys from reputable companies that have manufactured their products specifically for doggy destruction. Also, ensure they aren’t chewing or ingesting any small pieces of any other toys that might be lying around Christmas morning. Last year we pup together a holiday shopping guide for dogs. One of the magical things about the holidays are the beautiful decorations and lights. Remember that trees, baubles and lights/cords can all be hazards. Make sure your tree is secure and any tempting chew-worthy decorations are out of reach. It’s also a good idea to keep any electrical cords out of harm’s way as well as any poisonous greenery like holly, mistletoe and poinsettias. Whooo-hooo! Celebrations often come with some loud noises. Our pups can be sensitive to loud music and the pops and clangs that come with holiday gatherings. If your dog get startled or has some noise-anxiety, try to have a quiet space for them that is away from the booming sounds. Here’s hoping it doesn’t come to it, but if Fido tends to run and hide, make sure that doors are closed and backyard gates are secure. Here’s what to do if your dog is lost. Hopefully as dog owners we’re all aware of the majorly toxic foods that we need to keep away from our furry friends, we’ve even made a handy list of the main toxic foods for you dog such as, chocolate, alcohol and sugar. Here’s 5 of the best homemade treats you can make for your pooch. Make sure to travel safe with your dog if they're coming with you to visit family and friends. Some dogs love the car and others have a harder time. If your pup tends to get stressed while in the car check out our tips for travelling with a stressed dog. Alternatively, consider dog boarding if travelling with your doggy friend is just too difficult.